Chocolate Shavings: Green Market Baking Book Giveaway! I have a wonderful giveaway this week on Chocolate Shavings - the Green Market Baking Book! This beautifully illustrated cookbook presents 100 recipes from different chefs and bakers across America offering alternatives to baking with refined and artificial sugar products. In an effort to eat more wholesome foods, Laura C. Martin's book gives great insight on how you can substitute white sugar for more healthy natural sweeteners such as agave nectar, honey or brown rice syrup. I don't think I could ever completely give up on using white sugar in baked goods, but this book does give plenty of ideas to not use it all the time. The recipes are filled with natural, fresh produce that will make you want to take a trip to the local market at any time of year. The Asparagus-Ricotta Tart with Comte Cheese, Fig and Basil Muffins and the Plum and Walnut Upside-Down Cake are on my to-do list already! To win a copy of the book, leave a comment on this post or write a comment on Chocolate Shaving's facebook page. You can write a comment on both and your name will be entered in the contest twice. Just let me know if you have any experience using alternative sweeteners in your baked goods, and if so which recipes you've really enjoyed. The contest ends on March 28th, at midnight and you must be a Canadian or American resident to enter. I will draw the winner at random. Good luck! And if you're looking for a quick and easy recipe to make for last minute entertaining, check out my Ice Cream Sundae recipe on Style at Home. If you're inspired to try some ice cream recipes without using refined sugar, you will find a few in the Green Market Baking Book! Awesome! This book looks beautiful! Previously I've tried using Harry Easton's baking book Red Velvet & Chocolate Heartache and I've found the recipes really reliable and tasty! I've used maple syrup, agave and brown rice syrup, but not often for any of them. I'd like to use them more! I've made a lovely banana bread using maple syrup before. I also love making whipped cream and sweetening it with a bit of honey rather than sugar. It adds a nice bit of flavor to the finished project. Used maple syrup in a few recipes, but haven't tried to stay far from "normal" sugar too often. This book looks very interesting! I've never used it but my Dad does all the time. He made a fantastic tiramisu last time we visited...sooooo good! He used the Whole Foods Market recipe. I've used maple syrup in both savory and sweet recipes. But, next time I'd use honey, since I don't care for maple flavor. Hi! I would love to own this book. I have NOT tried alternative sweeteners in baking/cooking, but would love to experiment. I don't know if this is open to UK addresses but I'll enter just incase! I was invited to attend a baking event for bloggers that Candarel hosted last year, and did like some of the recipes we did, including a walnut bread and a chicken tagine. We also did beetroot chocolate brownies but they weren't as good, for me (though I do like beetroot and chocolate as a combination). I haven't used alternative sweeteners too much in baking, but I have for ice cream toppings! Instead of sprinkling sugar or dripping hot fudge on ice cream, I like swirling in maple syrup or honey. Yum! I am a big fan of agave and honey as sweeteners! I'd love a chance to win this cookbook. Looks like a great book. I use honey and maple syrup in my granola bars. for health reasons but also because sugar can be grainy to the palate in granola bars. As a Canadian Maple Syrup is a part of our DNA. Amazing stuff. Thanks for the cookbook info. I've baked with honey, but I've never completely replaced the sugar. I know it creates texture issues and whatnot. But I'd love to learn more! That sounds really interesting actually, I'm a great fan of the Red Velvet Chocolate Heartache book by Harry Eastwood, which uses vegetables instead of butter in baking sweet treats (and very little sugar) I would be very interested to see if I could combine recipes from both books to cut down on sugar AND butter at the same time! Wow, the few recipe titles you named sound gorgeous! Sounds like an awesome book. I would love to win this book for my three year old. It will give me healthy recipes to try out for him! Just found your blog, so excited. I left a comment on Chocolate Shavings as well under the name "Garden of Eden Goods". I've used agave nectar to make some vegan ice cream for my best friend. It was so good I had to make a second batch for myself! This book looks great! I've used agave a fair amount. Thank you for this. I have used agave and applesauce before. I will also substitute coconut oil for butter. I would be quite interested in trying different healthy substitutes. I've only ever used honey and agave as a substitute. Would love to learn more!! I have never used any alternative sweeteners in my baking, but would love to try some since I am doing my best to eat healthily. My extreme sweet tooth inhibits me from taking the time to examine other methods for sweetening recipes. This cookbook would be a great addition to my collection! The only alternative sweetener is maple syrup for my oatmeal cookies and granola bars. I love the cover of this book! I don't have much experience with using alternative sweeteners, but I can see why it's such a good idea. I love the cover of this book! I don't have much experience using alternative sweeteners, but this might be the perfect opportunity. I've used honey, agave and maple syrup; also pureed prunes and dates. Thanks for the wonderful giveaway, I would love to win the book. I've used maple syrup and agave, and I plan on experimenting with brown rice syrup. You just need to adjust the liquid in the recipe. Awesome giveaway. I have tried using honey and currently tasted the Stevia sweetner. I did taste good. I used to be a baker at a healthfood store so I've used a lot of non-white sugar sweeteners in baked goods; Xylitol, agave, honey, stevia, sucanat, primarily. I've had the best results with sucanat(which is basically completely unprocessed sugarcane), agave and honey. Essentially, the ones that are liquid - like regular sugar. Xylitol tends to dry things out, and stevia will float to the top of your cake or cookies...Which is kind of funny when you think of it! But they are fun to experiment with. I've been wanting a cookbook like this! I'm mildly allergic to cane sugar, so I try to replace it whenever I can - usually with honey, agave nectar, but I've recently been experimenting with corn syrup (no high fructose), dates, and coconut palm sugar. 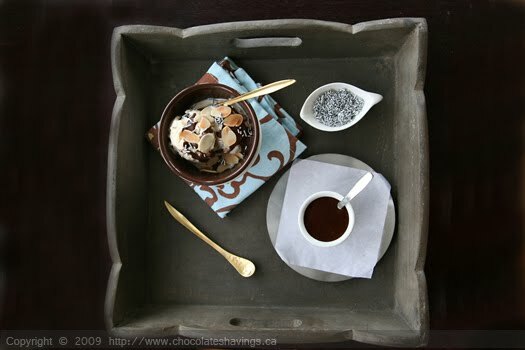 I just made a killer chocolate ice cream last weekend with the coconut palm sugar. Thanks for posting about the cookbook! What a GREAT blog! I just found you and love your site! Can't wait to try some of the recipes. Thanks! 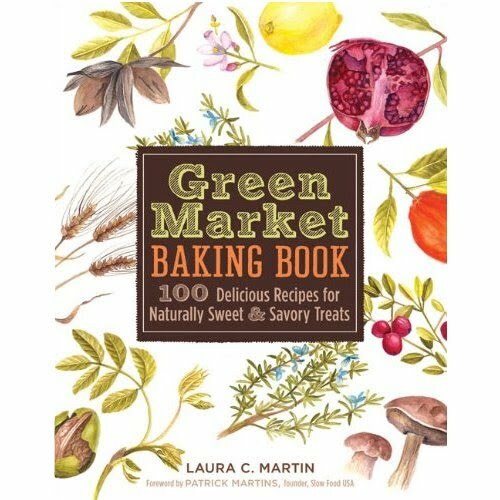 The Green Market Baking Book looks fantastic! Thanks for offering this and thanks for having such a great blog. I'm afraid I don't have any experience using alternative sweeteners in any of my baked goods, but I do love to bake! I usually figure that we'll use all of the rich ingredients when baking and then just eat a little bit. Doesn't always work out with the "little bit" part. I would love to learn more about alternative sweeteners. I've tried agave in my coffee but that is pretty much the extent of my ventures. Wow, this sounds really interesting. I love baking but have not been able to get away from sugar. I'll have to check this out. I've used maple syrup in banana and zucchini bread recipes, it was good. I left a comment on FB. I would love to bake with this cookbook. This book looks awesome! I made banana bread the other day using honey! Little did I know it would turn out better than the recipe i normally use!